Ralph Lauren golf pants, designed for the 2018 U.S. Ryder Cup Team collection. 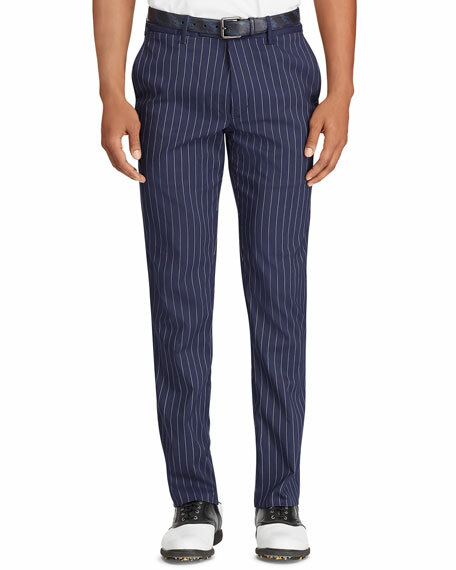 Cut from lightweight pinstriped gabardine with stretch and recovery properties. “RLX” nameplate above the back right pocket. Two front angled pockets; right hip coin pocket. Back left buttoned pocket. Back right button-and-loop pocket. Classic fit through straight legs. These Joseph & Feiss golf slacks have exclusive features that will enhance your game and give you hours of comfortable wear. These activewear slacks feature a slider waist band that expands up to three inches for ease of movement a gripper waistband to keep shirts neatly tucked and enlarged pockets to hold golf balls or gloves. Its safe to say these will probably be the most comfortable, carefree pants youll ever wear. on or off the golf course. Tailored with a self-adjusting slider waistband that adds up to 3-inches of comfort and a shirt-gripper to keep tops neatly tucked. This fluid, lightweight fabric is also water and stain resistant so spills roll off instantly. Soft, breathable, built to last, make your next tee time your best yet. Pleated front. Oversized, reinforced pockets. Cuffed bottoms. These stylish, easy-care slacks are a perfect choice on or off the golf course. Comfortable slider waist adds up to 3-inches. Machine washable and tumble dry. Water and stain resistant. Gripper waistband to hold shirt securely. Hemmed bottoms. Casual and comfortable this lightweight golf jacket keeps wind out and warmth in.